Snehashish Ghosh does a further analysis of the leaked list of the websites blocked by the Indian Government from August 18, 2012 till August 21, 2012 (“leaked list”). http://hinduexistance.files.wordpress.com/..., which appears on the leaked list, does not exist because the URL is incorrect. However, the correct URL does contain an image which, in my opinion, can be considered to be capable of inciting violence. It has not been blocked due to a spelling error in the order. Instead of blocking hinduexistence.wordpress.com/... the DoT has ordered the blocking of hinduexistance.wordpress.com/..., which does not exist. URLs such as, http://farazahmed.com/..., mumblingminion.blogspot.com, were blocked. The content on these URLs was in fact debunking the fake photographs. 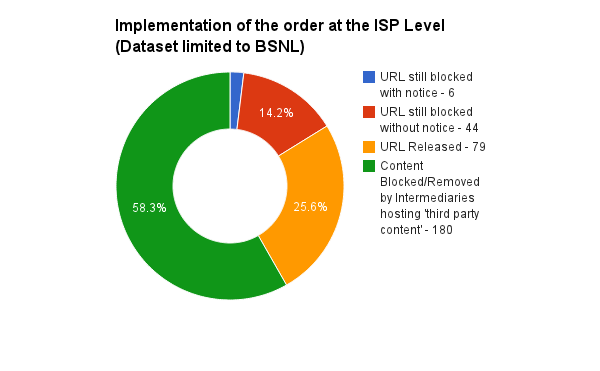 Going by the leaked list of websites blocked by DoT, it issued the block orders to ‘all internet service licensees’. Intermediaries that do not fall in the category of 'internet service licensees’ were also sent a separate set of requests for taking down third party content. However, it is unclear under which provision of the law such request was made by the Government. This was re-posted by Medianama on September 26, 2012.